The overwhelming majority of caches I have found are traditional: 78%, in fact. This comes as no surprise, as traditional caches remain the most common type of cache in Ireland. *Waymarks (not available for logging on geocaching.com, but on waymarking.com – Groundspeak describes waymarks as the ‘new locationless caches’. One of these will hopefully be turned in to a smiley later this year, when I visit Geocaching HQ in October. In April 2014, I managed to find 7 geocache icons in a day, which wasn’t an easy feat for me. 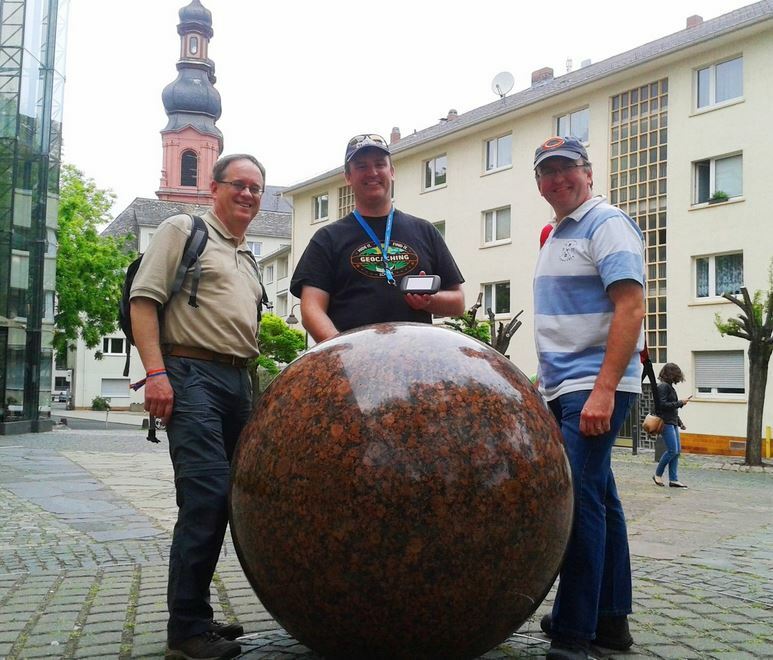 Recently, Irish geocacher GoldCircle travelled to the Giga event in Mainz, along with tmsr and Doug.G, and took the opportunity to bag as many icons as possible in one day: a very impressive 14!! I asked GoldCircle to tell me about the day and how difficult it was to get that number of icons. sarahmur: Describe the day of the Giga event. 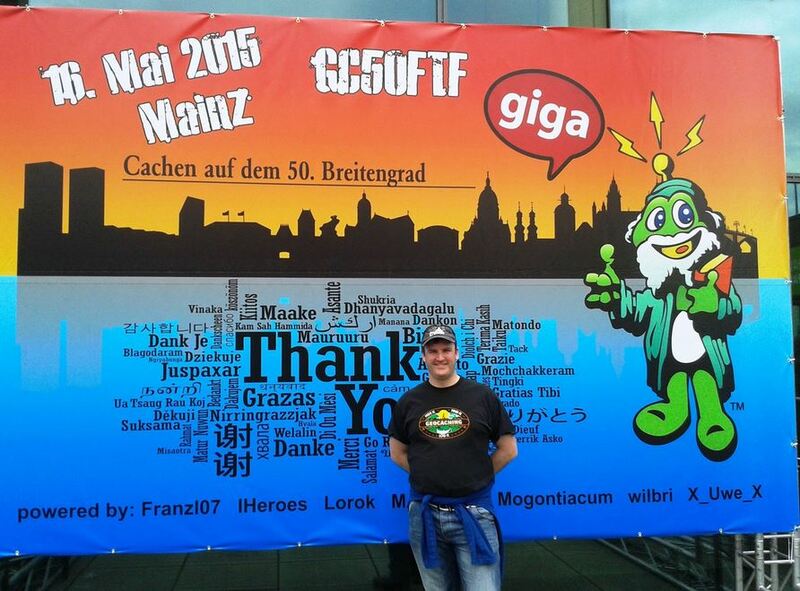 GoldCircle: I attended a Mega last year and, well, it just wasn’t me – too many people, not enough caching! So, I tailored my expectations accordingly – a Giga is a minimum of 5,000 people – so, I knew it was going to be a particular type of day. That said, the Mega was in the lashings of Scottish rain – while the Giga provided blue skies and sunburn, so the queuing was, well, rather pleasant! (This had nothing to do with the draft German pilzner available at the public area in front of the Giga exhibition hall!) Additionally, Mainz has a lot more geo-attractions! On arrival, we saw a long queue – and figured it was the entry line to the Giga – I couldn’t have been more wrong – I was able to access the Giga log in seconds – the queue was for the GPS Maze… 2 hours waiting time, we were advised… still, it was only an hour and a bit, there was beer – and some very jolly German company to help pass the time. The GPS Maze was important to us for all sorts of reasons – none of us had the icon, we needed it as part of our challenge of the day – to top our previous best for icon types in a day achieved in Holland in March – and in my case, I’ve been trying to land different icon types on my milestones, so this was 1600. As soon as the Giga and Maze were logged – and the few Lab Caches right there – we got about our business and moved away form the crowds (though with that many cachers in town – everywhere was busy). S: Why did you decide to chase the icons? S: How much planning went in to your trip? G: Surprisingly little. I only booked it about two weeks in advance. Having done a number of weekend trips with Doug.G, Gerpod1, Fitzet, tmsr, misteek and others, we’ve kinda found our way to focussing on key targets. The big lesson on a weekend trip is a) that there is never enough time and b) there is never enough time. As a result, we focussed on the required targets – then picked a few alternatives to cover the possibility of a DNF – and then a few specials are always allowed on the list – an odd virtual or webcam, perhaps an early Jasmer date – or just something that someone needs and cannot get at home. I’d say the whole day was planned in an hour or less (plus time for solving a few puzzles) – and then re-planned in a half hour once it became apparent that local cache owners in Mainz were disabling their caches ahead of the onslaught. To counter this, we did a tradi, multi and mystery in Dublin in the wee hours before the flight to Frankfurt. We had an event at the airport – so we had 4 types logged before 7am. S: Was there any point at which you thought you might not achieve all 14 icons? G: No. This was, in fact, a surprisingly straight forward enterprise. 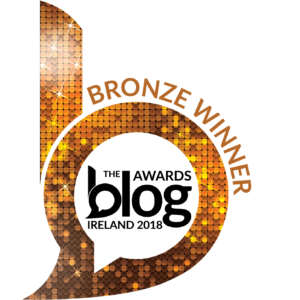 By 5pm, we knew, barring a delayed flight to the CITO in Dublin, it was in the bag. The killer on cache-types-in-a-day runs is always the Whereigo – you have to wrestle with lumpy beta technology and foreign languages all in one go – and you are at the mercy of the gods as to whether the cartrige will run. S: Would you do anything differently now? G: Since our flight home to Dublin left bang on time, we probably could have fitted in a few more interestingly D/T rated caches – Mainz has a line of 81 mystery caches right on the 50th parallel. If we’d had more time – and a whole lot more brain power – we could have filled a D/T grid in a day – that would have been cool! S: Would you do it again? G: Yes. In a heart beat. 14 icons in a day is very impressive! I know a group of Irish geocachers who found 10 icons in a day in Dublin last April and that wasn’t easy. How many icons have you found in one day? What challenges do you set yourself to keep geocaching interesting? Last month, I found some great multi-caches and it got me thinking about how very underrated they are. 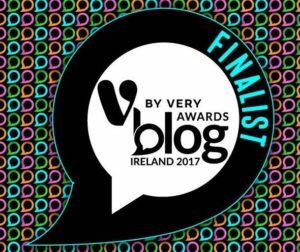 In Ireland, anyway. Part of the reason I found multis this month was for the challenge cache I have been working on since last year: Dublin’s Top 20 Multi Challenge by GoldCircle (GC4M87N). Not only was this challenge a rare DT I needed, it encouraged me to seek out multi-caches, and really good ones at that! The last three I needed were Jailhouse Rock by Blue Jay (GC23CWD), Martello Tour by albertw & min (GCPWFB) and the absolutely amazingly good #2 – The Crystal Maze by Bilbos Apprentice (GC5N96E). There are currently three Crystal Maze caches in Dublin, although the owner tells me there are more planned. I have only done two – the above multi and the mystery cache #1 – The Crystal Maze (GC5K93C), which is incidentally only the second ever 5/5 cache I have found. 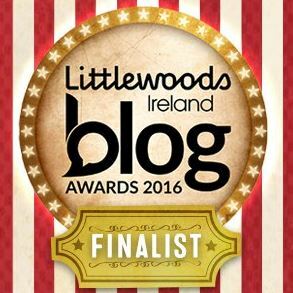 Both are brilliant and highly recommended. I don’t want to give anything away and ruin the fun, but suffice to say that they will drive you mad and delight you in equal measures! I managed to bag two FTFs on great multi-caches in June too: Half Moon Lake by rundmck (GC5XMR7) and Tailor Made by icklelego and Fadingdimensions (GC5XNAY). My favourite multi of the month though had to be I love Blue Peter! by 4-goodies (GC4A7PT). I was in Mediacityuk for one night and the next morning, I simply had to have this cache before heading to Derbyshire. 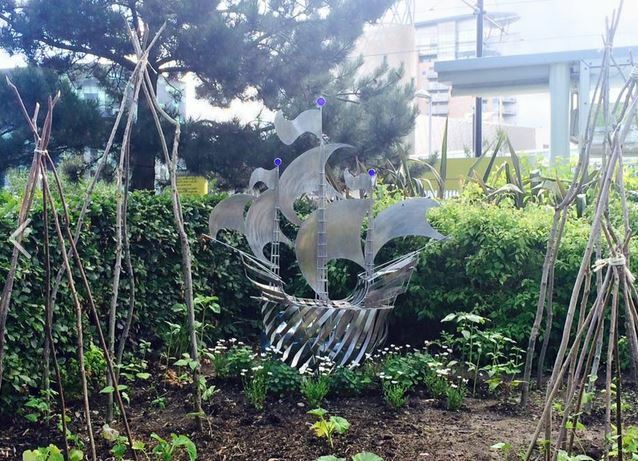 Blue Peter was an absolute must-watch TV show when I was growing up and it was quite a treat to visit the garden – this cache was the cherry on top! 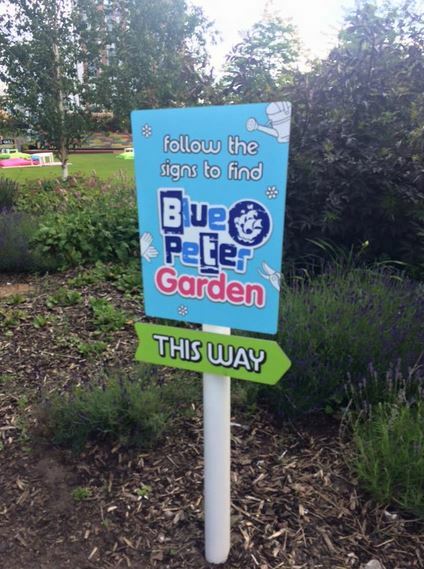 This way to the Blue Peter Garden! The garden was a lot smaller than I had imagined it would be but it was fun to see all the handprints of the presenters and the pawprints of the furry cast members too! The famous Blue Peter symbol! While I am a fan of multis, I still can’t decide which cache type is my favourite. I am partial to an earthcache, maybe because they’re quite rare in Ireland. My milestones from 500 to 1,000 were all earthcaches (thanks to a lot of planning!). Tell me about your favourite cache type in the comments! At the end of July, I’ll be travelling to Essex to attend the 8th UK mega. Will I see any of you there? I look forward to telling you all about my adventures at the mega! Interesting: I based my information on the groundspeak page about cache types (see link in the post) and removed 10 Years! Event as it’s no longer possible to find a cache like this. What are the additional cache types you are aware of? I added locationless as waymarks as the website calls waymarks ‘new locationless caches’. I have slightly altered that part based on your comments. Block party is one if I remember correctly. I think Wherigos are my favourites as they involve a bit more than just finding the physical cache but are out in the field using your gps as well. Having said that a bad Wherigo can be truly awful and smartphone battery failure close to the end of completing one is majorly frustrating. Yes you could be right about Block Party although this year is the last – interesting that they’re not listed on that Groundspeak link though!